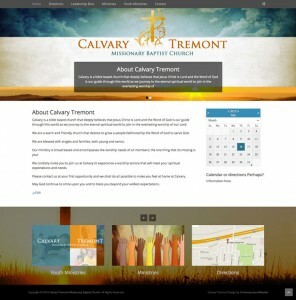 Calvary Tremont Missionary Baptist Church needed a wonderful new website that can take them into the future (and beyond). 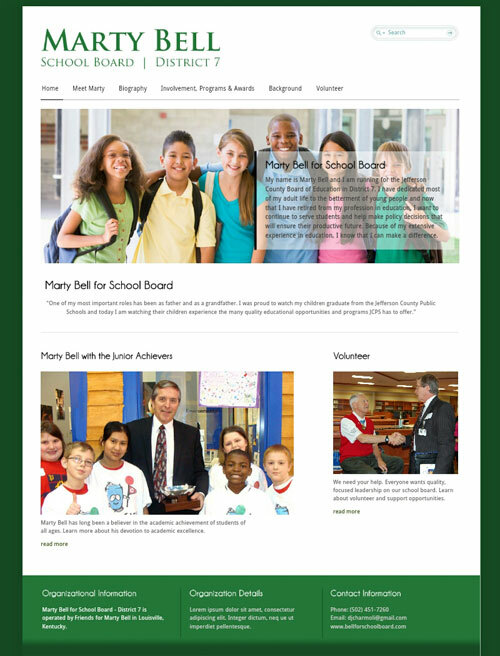 Contemporary Websites created a website which accurately displays their many missionary and ministry programs for youth, adults and seniors alike. Many conceptual variations for the site were taken into consideration when building the site which will be used by a wide audience. Like all of our recent projects their site is SEO optimized and adjusts for different screen sizes. 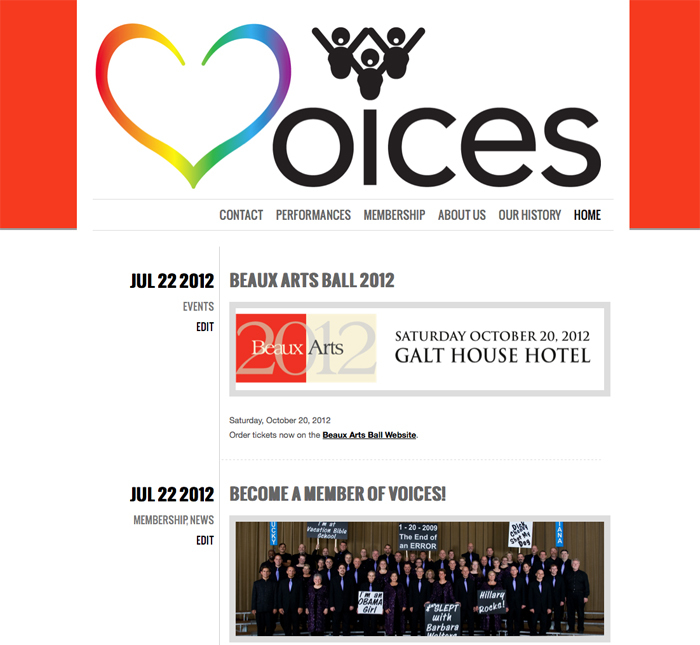 Give it a spin on your laptop, desktop, tablet or smartphone – the site is fully responsive. The Snowy Owl Foundation is a non-profit 501 c3 whose mission is to create a better world through the development of community structures surrounding the arts, culture, human need, and land preservation. Contemporary Websites built a web presence for them which expressed their mission. The site was a new site – it’s administrator’s were taught the “back-end” of the site and now control its content all by themselves! 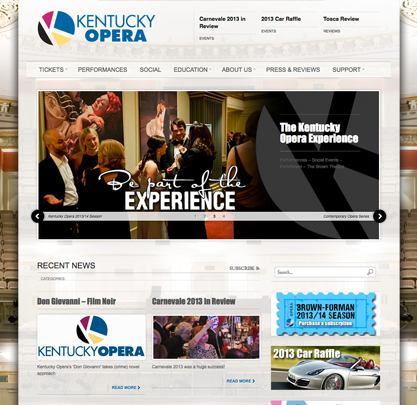 Organizational site representing the 58 year old Kentucky Opera. 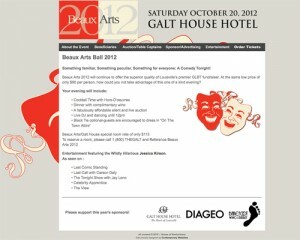 Kentucky Opera needed to extend its reach into the modern age. They had sound clips fantastic photography, loads of educational and developmental information yet no proper platform to display it all and make it available to the wider public. 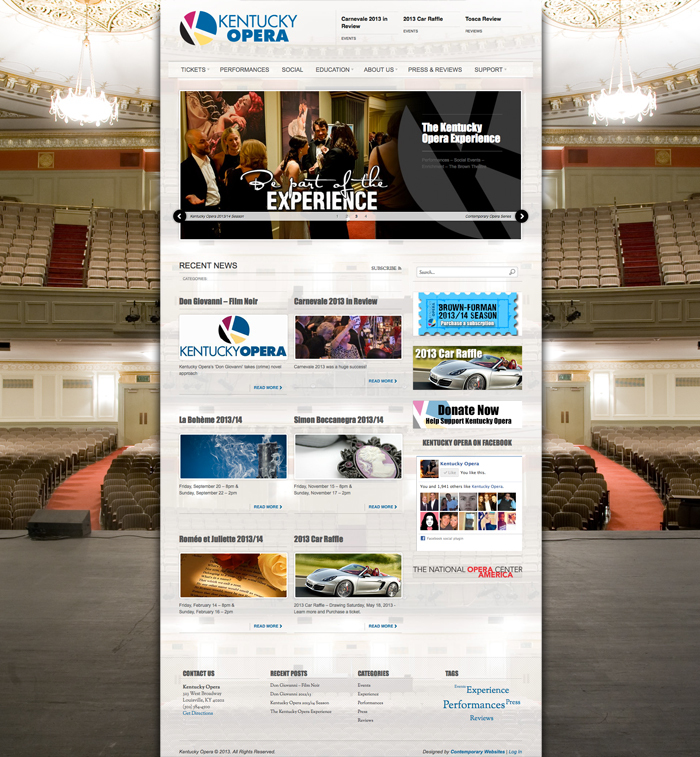 Kentucky Opera now has a dynamic, socially networked web presence which is easy to maintain and reach out to their connected audience well past their upcoming 60th birthday. Flash, MP3s, Java Script, CSS5, HTML, Photoshop, SEO optimizations, Live Twitter feeds. 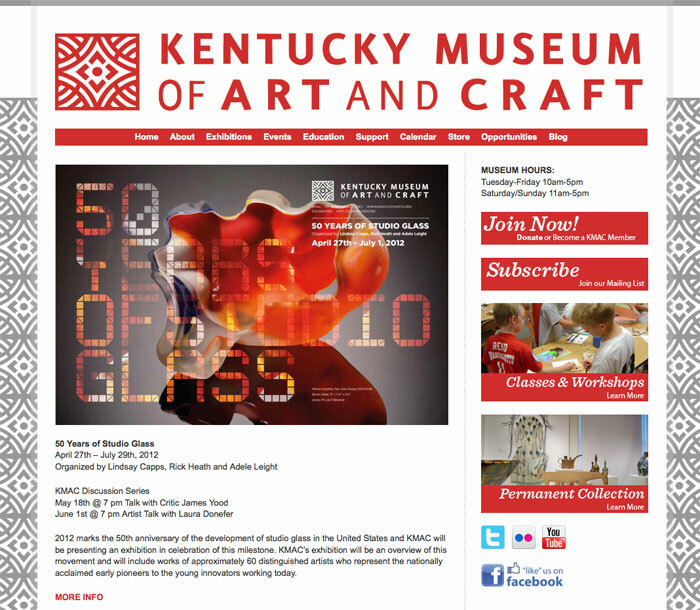 Kentucky Museum of Art and Craft – With a mission to promote the art and craft of the State of Kentucky this powerhouse organization – celebrating its 30th anniversary – needed a makeover from the ground up for their 13 year old out-dated website. This design is built in a content management system too – making it easy as pie to update and keep they visitors and subscribers informed. Flash, Java Script, CSS, HTML5, Photoshop, Illustrator, SEO optimizations, Content Management System for easy updates. The VOICES of Kentuckiana have been bring joy through song for nearly 2 decades. 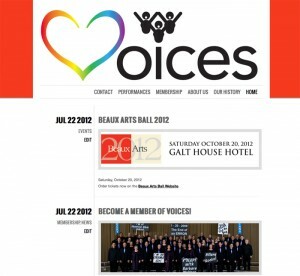 A non-profit organization based in Louisville Kentucky – VOICES needed a website to promote performances, post membership information and inform their fans about upcoming events. 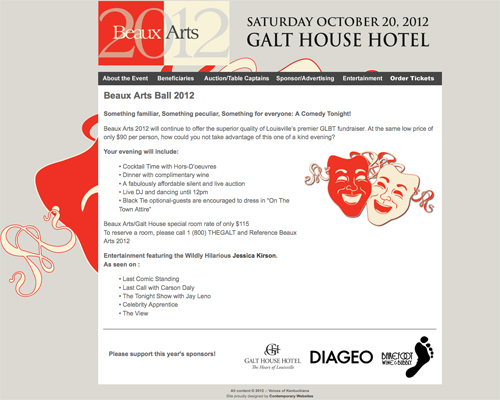 The Beaux Arts Ball is an annual event that draws hundreds of people who come out to support Kentucky/Indiana’s leading choir group, Voices of Kentuckiana. 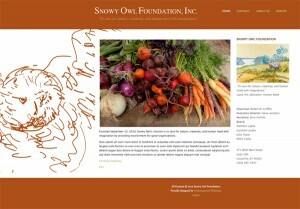 This was a complete redesign of the site with shopping cart and performance information. 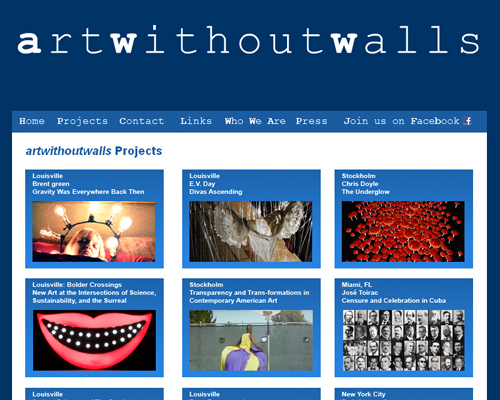 artwithoutwalls works with artists to create installations, programs, performances, and projects in a wide variety of sites, both physical and virtual,and joins with artists to present projects that might not otherwise be realized. 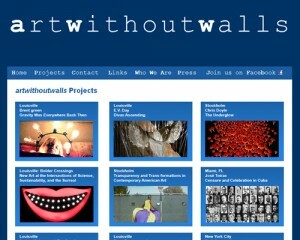 artwithoutwalls needed a site to quickly and artfully display its new features and projects – sometimes launching a web-based componient at the same moment as a a reality-based project. 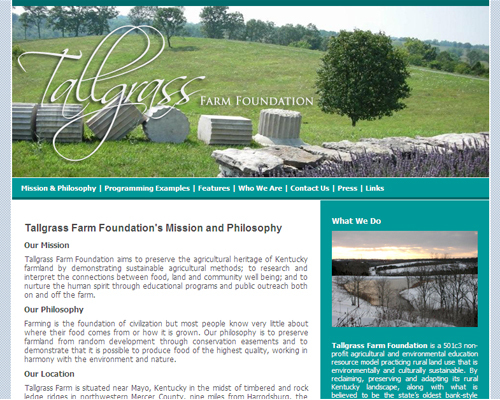 Tallgrass Farm Foundation is a non-profit organization devoted to preservation and education. Tallgrass Farm is located on 1400 acres of farmland in rural Kentucky. Seeing the suburban architecture sprout up all around them the organization’s directors decided to devote the entire farm into a land trust to preserve it for future generations. Tallgrass needed a contemporary easy-to-navigate web presence which would display its mission with recent news and beautiful photography.